A DAY AFTER a violent mob of Sidi tribals clashed with police in Talala in Gir Somnath district, police on Monday arrested 31 tribals — 24 men and seven women — in connection with the violent clash. There was, however, no report of any untoward incident from anywhere in the district, though police continued to remain deployed in the violence-affected villages. Violence had broken out at Gundaran village of Talala taluka after members of Ahir community and Sidi tribe clashed over a minor tiff on Saturday evening. The situation escalated on Sunday afternoon when mobs of Sidi tribe blocked a road between Madhupur and Jambur village. Police had rushed to the spot and ordered the mob to disperse. But instead, the mob started pelting stones, injuring three policemen and a few others. Eventually, to disperse the rioters, police lobbed teargas shells and resorted to mild lathicharge, and detained some of the accused. “Today, 31 people were arrested in connection with this case. They include 24 men and seven women. They were detained from the spot of violence on Sunday. They had blocked road and attacked police,” Hitesh Joysar, Superintendent of Police (Gir Somnath) said. Joysar confirmed that all those arrested were Sidi tribals. They and 13 others have been booked for attempt to murder, preventing public servant from discharging his duty, dacoity etc on the basis of a complaint filed by head constable Vira Ghiyad of Gundaran police outpost. “In all, we have registered five cases in connection with the clashes. But these arrests have been made with respect to the incident in which police were attacked on Sunday afternoon. We will arrest more persons who are accused in other cases soon,” Joysar added. He said the situation was peaceful and totally under control. “We have deployed three companies of SRP in Gundaran and Jambur villages. Three Deputy SPs have also been deployed in the area. No untoward incident has been reported from anywhere on Monday. We have called a meeting of local peace committee in Talala on Tuesday and leaders of all communities have been invited to it,” said the SP. 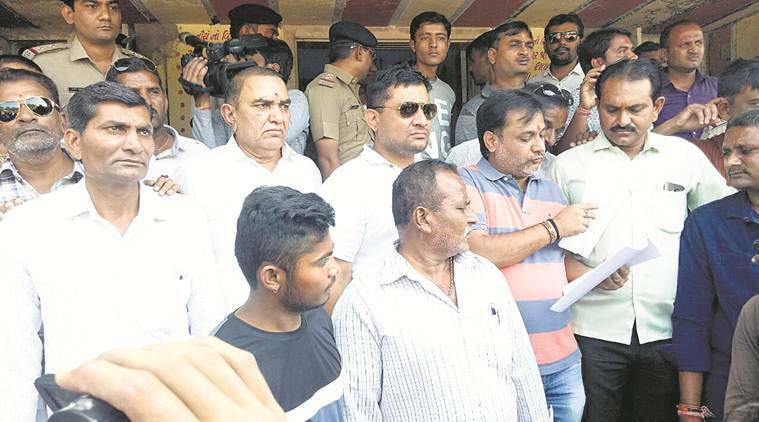 Meanwhile, BJP MLA from Talala, Govind Parmar, led a huge silent rally from Talala Taluka Panchayat office to the office of Talala mamlatdar in Talala town and submitted a memorandum demanding strict action against members of Sidi tribe. “I have appealed to all sides to maintain peace and law and order. We have also ordered authorities to take strict action against some anti-social elements in the Sidi community. The Hindu community submitted a memorandum and demanded that a police outpost be set up at Jambur village to prevent such incidents,” Parmar said. Jambur is the village dominated by Sidis, who are Muslims and have settled in and around Gir forest in Junagadh and Gir Somnath districts of Saurasthra for the last few centuries. A majority of the community are landless and work as labourers. The population of the tribe in Talala is expected to be around 10,000. The incident comes around five weeks before the state goes to polls in December. Parmar was elected MLA in May last year after death of sitting Congress MLA Jashubhai Barad.